In honor of this Labor Day holiday and my parents being in town for a visit, this week's Saturday Soiree is a "So Long, Summer" Bash! The menu is simple and delicious, decor- classic Americana and the intent to say goodbye to summer in style. It does not get much more American than cheeseburgers. My menu calls for burgers with a twist- mini sliders stuffed with pimiento cheese. This recipe can be easily modified depending on the number of attendees. Preheat grill. In a bowl, combine beef with onion powder, salt and pepper. Divide beef into golf ball sized portions and then flatten. Scoop a spoonful of pimiento cheese into center and place a flattened golf ball size portion on top. Repeat until finished. Cook burgers for 3-4 minutes on each side. Brush slices of bread with a touch of butter and grill for a few minutes. Place sliders in between two slices of grilled bread. Garnish with ketchup, mustard, relish, or slaw. * I am a vegetarian, so I would either do mini veggie burgers for myself or perhaps just a grilled cheese sandwich. Chop cabbage into strips or fine pieces, whatever you prefer. Combine cabbage with remaining ingredients and cool in refrigerator. 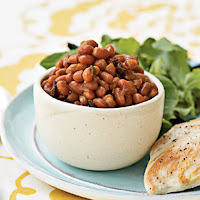 Combine all ingredients in a crock pot and cook on low for 3 hours. Watermelon salad- See recipe here. Dessert: I would pick up lemon bars and apple pie from our local bake shop. 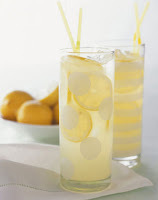 Drink: Beer of choice, lemonade and sweet tea. 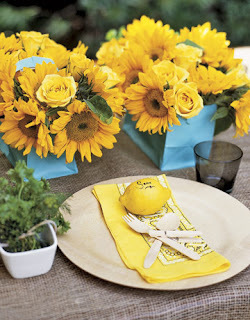 Decor: This great idea is from Country Living- place bouquets of sunflowers in gift bags, use a lemon as a place card (write name with permanent marker), burlap as the tablecloth and a handkerchief for a napkin (I would use red). Dress: I would wear something along these lines- comfortable and chic. All three of these dresses are from edressme.com. What more information? Click on the image for the scoop. This entry was posted on 7:43 AM and is filed under End of Summer Party , Labor Day Party , mini sliders . You can follow any responses to this entry through the RSS 2.0 feed. You can leave a response, or trackback from your own site. Oh yummy! That looks like a feast and what festive attire you have picked...It is always sad to see Summer end, but the memories are always pleasant to savor! all of that sounds so delicious! enjoy your weekend! this sounds seriously perfect! everyone is going to have a ball! You're making me hungry for America!!! Love the little sliders and have to dream up an event to serve them to European friends! I'm certain they'll be a hit! Sounds like such an amazing party! I wish I were invited! Thanks for sharing the details! Fantastic menu, the type that I could eat almost every day. Lovely photos..
That was a stunningly beautiful themed lunch. I will definitely try it next time when I have friends over for lunch. Its bright and cheery. Loved the watermelon salad. Waiting for your next post.